A drab Dixon Park draw was a big disappointment for fans of Ballyclare Comrades on the opening day of the season. 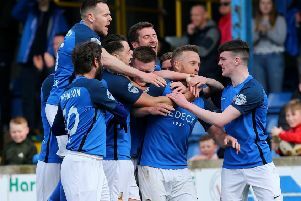 After one of the most successful pre-season programmes in recent years, David Dorrian’s lads managed only a 1-1 draw against a Loughgall side that had leaked ten goals the previous weekend against Linfield. Stand-in skipper Chris Getty celebrated having the captain’s armband by nodding in the goal that salvaged a Championship 1 point, after the County Armagh lads had opened the scoring. New signings Gregg Shannon, Michael McQuitty, William Wharry and John Dobbin were all given starting roles, along with promising striker Scott Cummings who stepped straight in from the Under 19s, while midweek signing Michael O’Hanlon was on the bench, as was another teenager, Michael Haskins, from the Reserves. The visitors looked sharp in the opening quarter with McMahon heading wide, while Rea fired over the top after the ball had rebounded off the assistant referee’s shins back in to the penalty area. Apart from two speculative long range efforts by Simpson when he spotted keeper Buchanan off his line Comrades offered little, but the game sparked in to life in the 28th minute, when Henderson’s deep cross to the back post found Rea, whose low volley gave Shannon no chance. Four minutes later parity was restored when Getty rose above his marker to nod firmly in to the bottom corner of the net from Samuel McIlveen’s corner. In the 38th minute the home goal survived a hectic goalmouth scramble, while at the opposite end Buchanan produced a brilliant near post reflex save to deny Chris Trussell, after McIlveen had brought the ball down the by-line, so the teams turned round all square. During a dull third quarter defences were on top with little action in the danger area until the 70th minute when Shannon was glad to see Mullen’s header flash wide. In the run-in Comrades had the edge but O’Hanlon and Duffin were off target from promising positions, so a draw was just about what the teams deserved. Ballyclare Comrades: Shannon; Doherty, Getty (C), Wharry, McQuitty, McIlveen, Dobbin, Simpson (E Hill 87’), Cummings (O’Hanlon 72’), Trussell, Duffin. Subs not used: McCart, A Hill, Haskins. Saturday’s match is away to Ards Rangers in the first round of the Steel & Sons Cup, and it will be played to a finish.